Just for fun, do a Facebook search and type in Instant Pot. Amazing, isn’t it? So many groups, so many recipes, so much information! 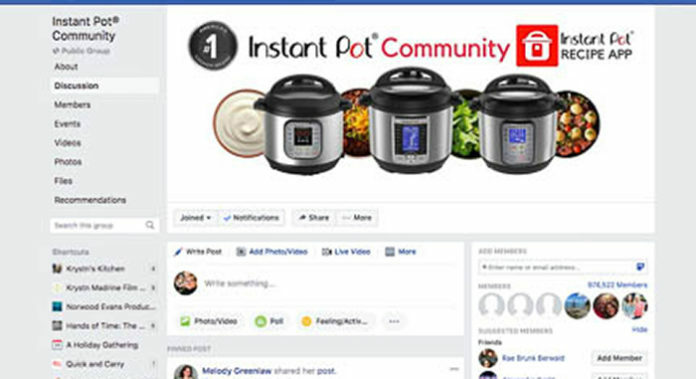 The Instant Pot Community page, run by the Instant Pot people themselves, is just shy of ONE MILLION USERS! On a Facebook group! That group is so very busy with the trading of recipes and information about the IP that it can be intimidating to new users, so, there are specialized groups just for the newbies. 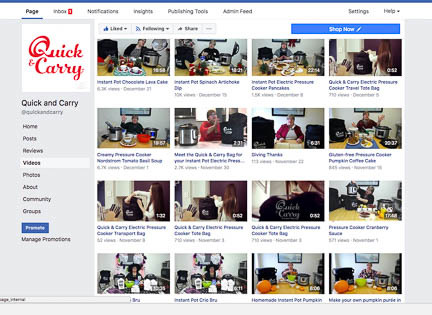 Most of the cookbook writers and bloggers have their own Facebook groups, too. There are groups for each and every kind of diet that is out there, with groups devoted to veganism, Weight Watchers, McDougall plan, Fit for Life, Whole 30, allergy free, Paleo, etc., on and on forever, amen. Do you need to join one of these groups? How do you know which group or groups to join? Some of the groups are closed, meaning you have to ask to join them, and others, like our Facebook page for Quick and Carry, are pages that feature information and community in an open way. We enjoy the pressure cooking community on Facebook so much that we would encourage you to join some of the groups to see how you like them – you can always unsubscribe. Some groups ask you to answer a couple of simple questions before joining, to weed out spam and bots. Once you are in a group, you can visit the files pages to see any collected information like the rules for the group – you should always read the rules because they are a little bit different from group to group! Each group is run by a team of administrators that have to approve each post, make sure the group stays on topic, and they also mediate any disputes that can and do arise when people are passionate about how they do things – yes, even cooking groups have conflicts! The files section of any Facebook group is also where to start looking if you need a certain recipe or have a specific question about how to cook with an Instant Pot. You can also post the questions to the page, but, you might get your answer faster if you check in the files – someone else has already asked and answered the same question you have, I promise! The files are typically a treasure chest of information, so always start there when you need information. Facebook is a wonderful resource for learning about cooking with an electric pressure cooker – you will meet people just as excited, clueless, intimidated, interested, scared, and/or experienced as you are!